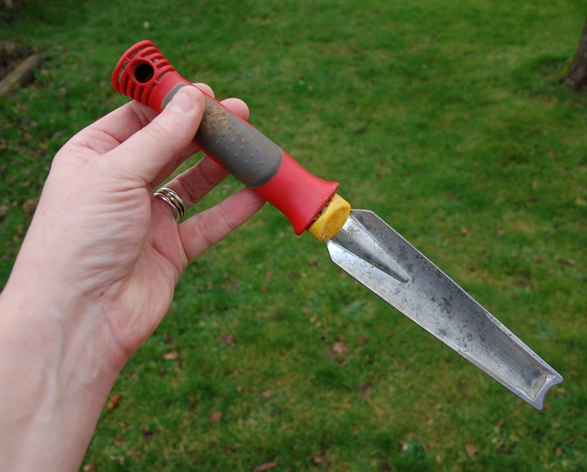 And our totally just made up award goes to… the Wolf Garten KS2K Weeding/Planting Knife! If I’m honest, we were a bit bemused when we first got it for Christmas 2016 from our good friend Derek. He of our recent cider video. But we should have trusted Derek’s insider knowledge as a keen veg grower himself. This odd looking tool has proved so much better than a traditional trowel for the surgical precision cutting out of deep-rooted weeds, that throughout last year there was constant competition between Emma and I to have it in our wheelbarrows. Perhaps we should just buy a second one! This entry was posted in Garden and tagged Derek Houston, Emma Alesworth, gardening, Paul Rainger, Smallholding, The Secret Acre, tools, Weeding Knife, Wolf Garten by paulrainger. Bookmark the permalink.